Designers provide ways into-and out of- the flood of words by breaking up text into pieces and offering shortcuts and alternate tones through masses of information. De-constructivist text takes theories like this to another level of communication, separating and distorting words to break the rules we automatically abide by, It’s this level of experimentation when presenting information that defines de-constructivism. 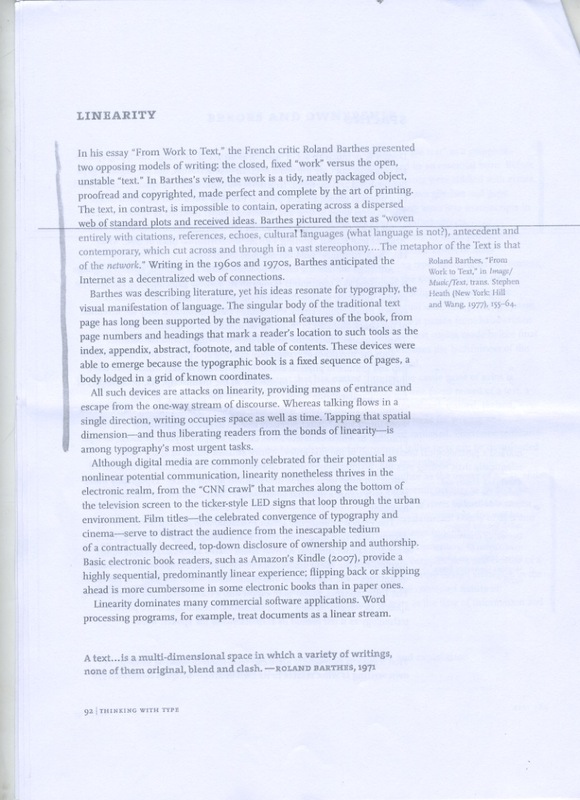 When reading a body of text we follow each word along the page because of the spaces left in-between each word, without these spaces the reader would be lost. The spaces our eyes naturally skip by when reading, physically exist when the words are spoken verbally due to the reader taking small pauses to breathe. 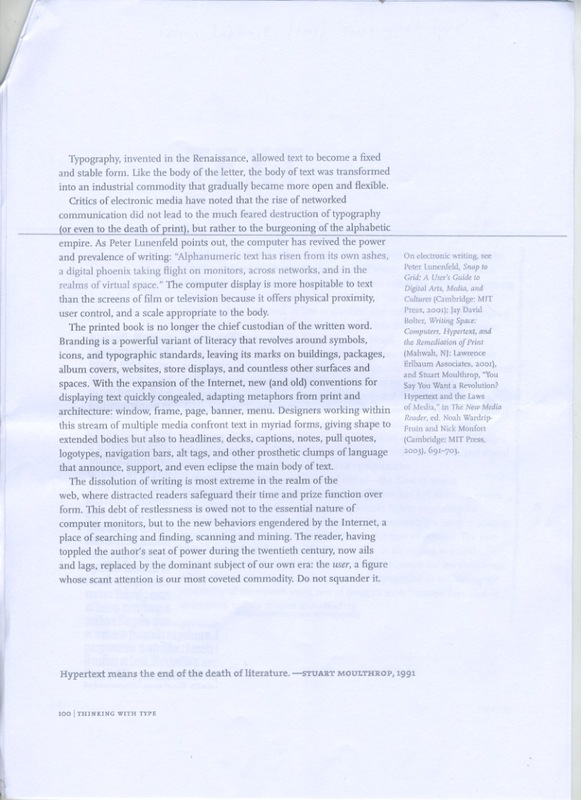 However ‘Spoken Language is perceived as a continuous flow, with no audible gaps.’ The transition from a sound to being recorded on paper gives the creator endless ways of presenting this information, the tones and pauses in each spoken sentence can be translated into space and punctuation so they are seen but not heard. 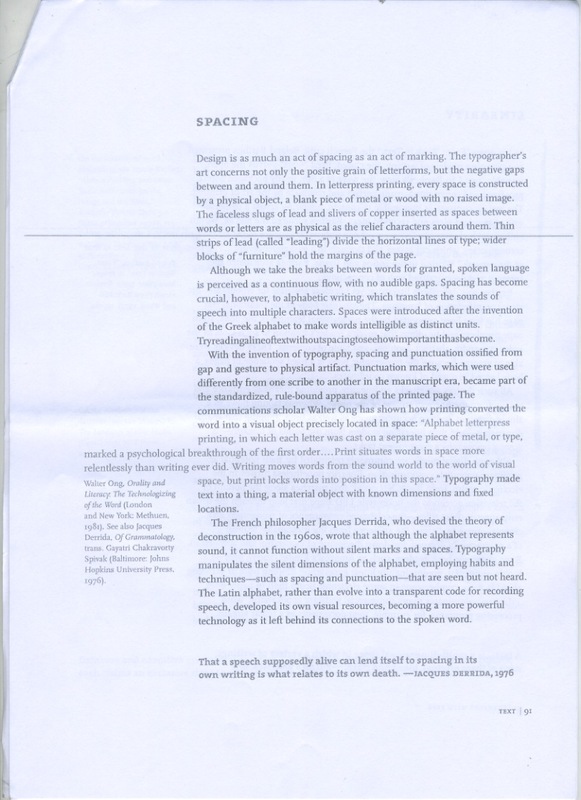 Spaces or indents are a form of vehicle used to make what we’re are reading visually understandable, but we only understand them because we’re used to following the text how it’s most commonly presented. 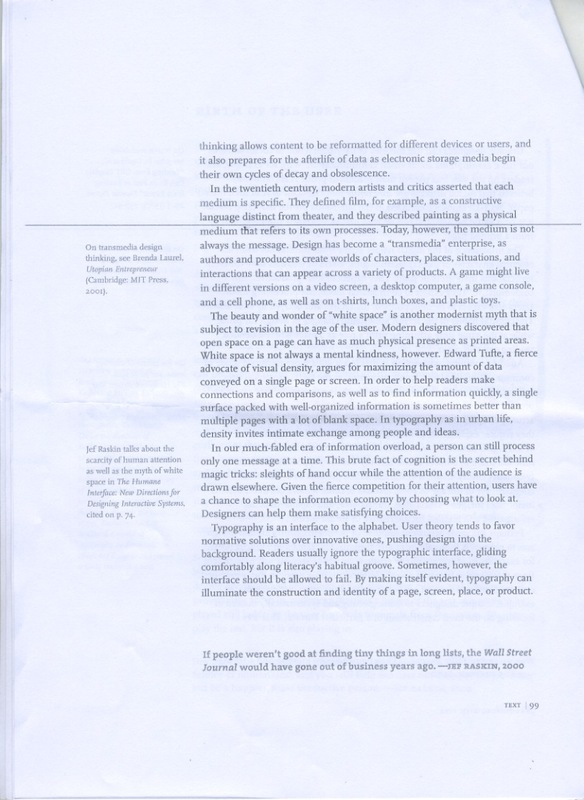 Typographers arrange text for their audience in a way that we all interpret for individually, however this forces us to navigating around a page according to the direction they want to send us in. Web designers have a pre-planned route for their audience to take when reading through a webpage thanks to hyperlinks and grid systems. They can encourage the readers eyes to notice certain things more than others by solely focusing on the arrangement of text and working with layout. However this takes the whole fun away from reading, reading should be an act of freedom where the viewer can jump from paragraph to paragraph reading only what they want to read, type is a vehicle that can be manipulated in endless ways and this is what reading should be about. 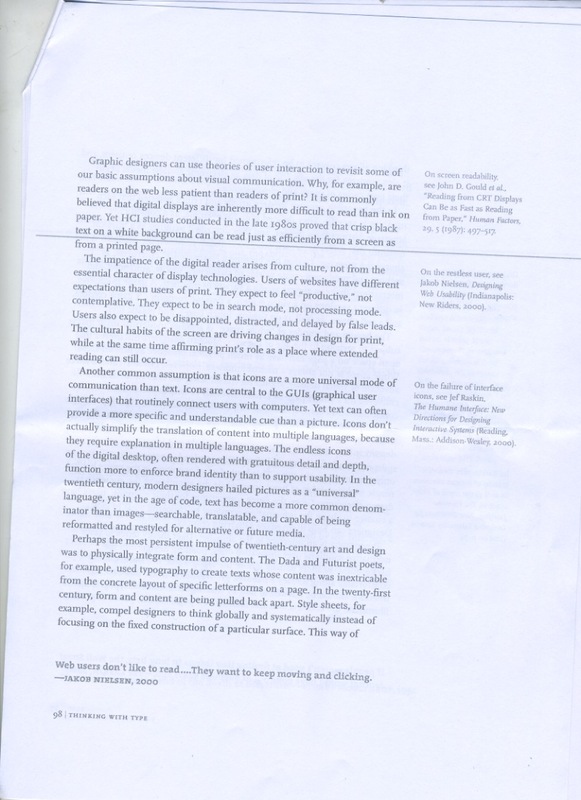 Traditional printing methods such as using a block press evolved from handwritten documents because of how text could be produced accurately and in mass production. I think that this almost limits the possibilities and variations of text that could be created because the hand-drawn feel is lost. ‘Typography has evolved from a stable body of objects to a flexible system of attributes’ This communicates that type can mean so much more to the reader than we realise. Type can define tone of voice, mood and character but when limited to a structure that arranges text in its most simplistic way we loose out on what is being put across to the audience. De-constructivist type is the opposite, and works with multiple ways of expression, using alterations to size and style to make a message more apparent. 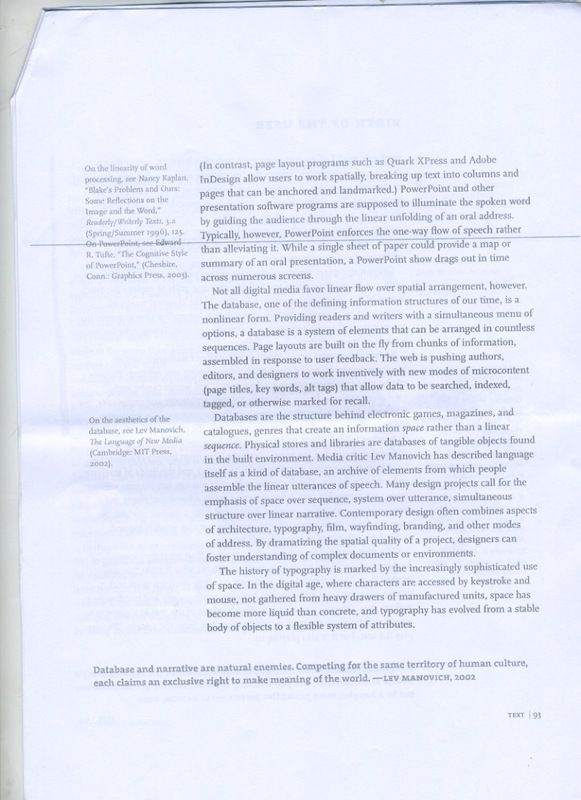 ‘Like an interpretation of a musical score, reading is a performance of the written word.’ This makes the possibilities endless for Designers to produce work where the type can communicate movement and shape. 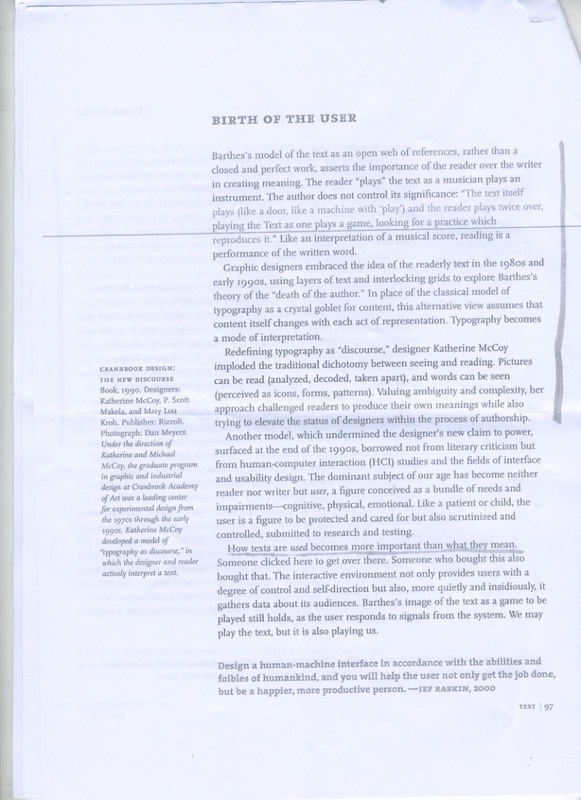 ‘The reader plays the text as a musician plays an instrument.’ As the reader navigates through each section of text they are sub-consciously prompted how to read by minimal details within the layout of the text. If these limitations were removed then reading would become not just about improving your intellect or engaging with an interest but it would become about being aesthetically pleased by the words in front of you. The image above is another piece of work by David Carson for Yale University Art Gallery 2010 open day. I picked to analyze this image because of how layered it is and how the type works as image. The first thing I noticed when I looked at this piece was the numbers '2010' on the left hand side because of how bold they are. After instantly digesting the shape of each number within a split second i started to notice the repetition of these numbers tucked underneath different layers of type. I like the depth the collaged text creates and how you can see through the negative space of certain letters to reveal different words. The combination of typefaces works really well, the handwritten type in the background is thin in width, and small in size therefore pushing the larger text to the front of the viewers perspective. Even though when looked at as a whole the information becomes hard to understand the vital guidelines of whats being promoted are still being communicated when your eyes scan smaller areas of the image. This only works because the image appears hard to decipher at a first glance, the mind thinks it complicated, however human nature encourages us to long to find out what the image actually means, making it easier to break down into smaller sections.